See Carsten Strathausen, trans, ‘Translator’s Preface: Dead Man Thinking’ in Boris Groys, Under Suspicion: A Phenomenology of Media, New York, Columbia University Press, 2012, xvii. New Materialism offers a framework for reimagining the role of the ”body-in-the-world” according to the Merleau-Ponty conception of a refigured materialist theory of perception and agency (Coole & Frost). What is especially refreshing about the theoretical implications are that potentialities can be explored and studied without immediately having to cover one’s back, if you will, with explications about how and why interconnected phenomena do not neccessarily point to an obsession with causality. Especially the shi concept, as presented by Bennett sums up this point of departure – namely recognizing a ”potential that originates not in human initiative but instead results from the very disposition of things” (Bennett). For a study of the implications for social domains of the configurative and material properties of urban form, the challenge for me is now rather to bring to the question a post-humanist perspective where human social constructs do not represent the only potential. For, as Marres points out (in Bennett), ”it is often hard to grasp just what the sources of agency are that make a particular event happen” and the ”ungraspability may be an [essential] aspect of agency”. Rather, the aim is to ”read and ride” the shi of a configuration or context (including moods, trends, culture etc) (Bennett). In practice, new materialism has some interesting implications for how we (designers) deal with complex, variable behavior not only in designing with new composites, but also in adapting old technologies to the reality that it is often non-craftsmen who implement and materialize them. Today, as Katie Lloyd Thomas pointed out in her talk, the architectural specification is not an expression of the designer ’speaking’ a common language to a craftsman, but has become a liability-tinged documentation which presumes future dischord. This is of course sad. Still, there is hope! 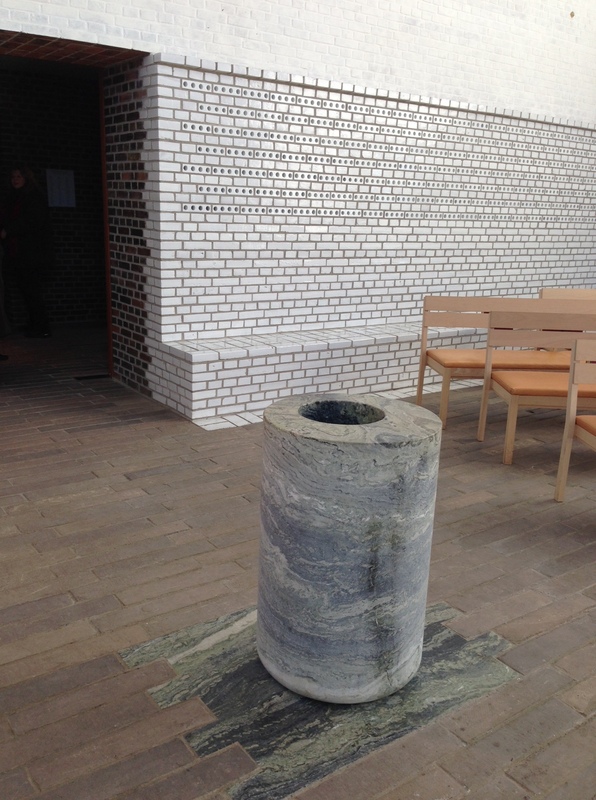 I was recently at a guided tour of the new Årsta kyrka by Johan Celsing and was uplifted by the humility and economy he showed in the face of the inevitable hurdles encountered during the construction process. The church is entirely out of brick and is constructed as an extension to an existing assembly-space used by the congregation. 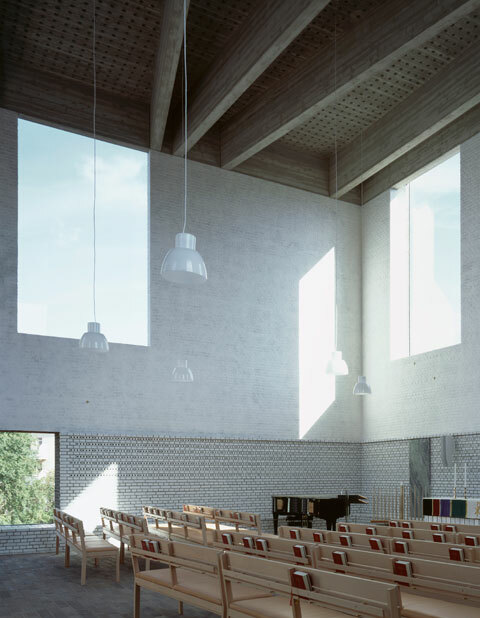 His approach was to incorporate the new church as a clear addition to the existing but for reasons of economy and sustainability, he opted to allow the old the meet new in a matter-of-fact way. The existing wood-panelled ceiling (cheap painted pine) was used in the extension to produce a concrete form which generated a negative cast of the original ceiling out of concrete rather than wood. 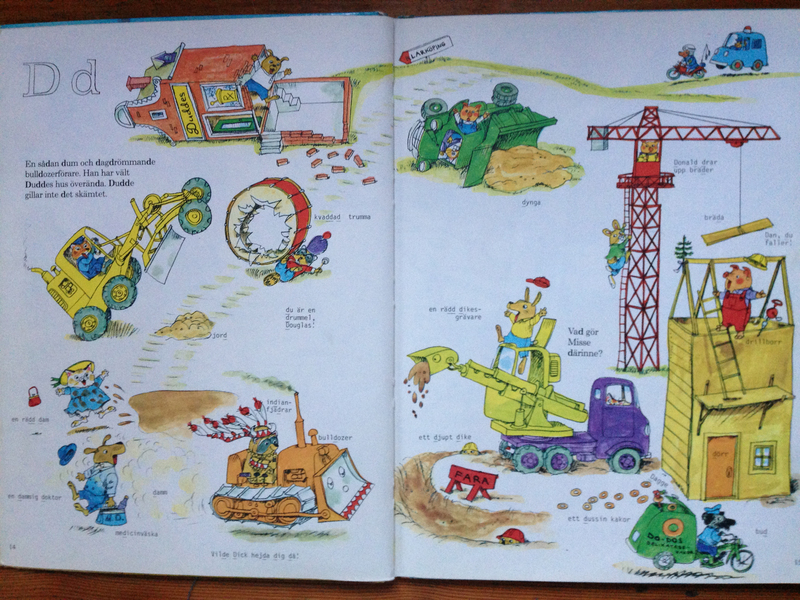 This is both subtle and tasteful in light of the immense wastefulness in the construction industry generally. It also speaks to a materialist sensibility, in which the building blocks, brick and concrete in this case exemplify the kind of relationship between tendencies and outcomes described by Bennett as ”porous, tenuous and indirect”. This, argues deLanda, is something which craftsmen understand (even embody? ): ”Artisans, craftsmen, and minor scientists in general, he argues, always had a different conception of the relation between matter and form, at least implicitly; they did not impose but teased a form out of an active material, collaborating with it in the production of a final product rather than commanding it to obey and passively receive in a previously defined form” (DeLanda). 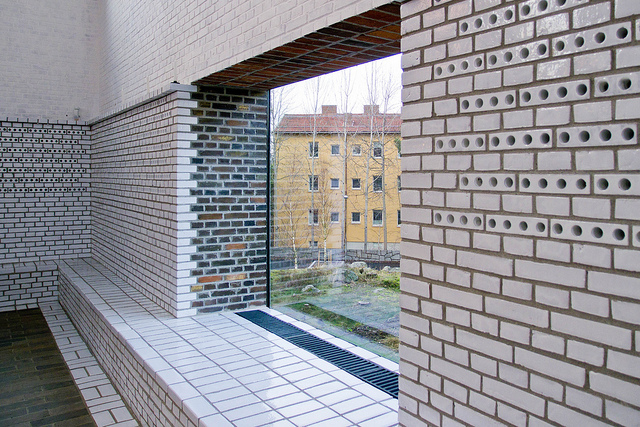 In Årsta kyrka, Celsing also uses a wrap-around corner effect in several instances to accomodate the materiality of the brick. 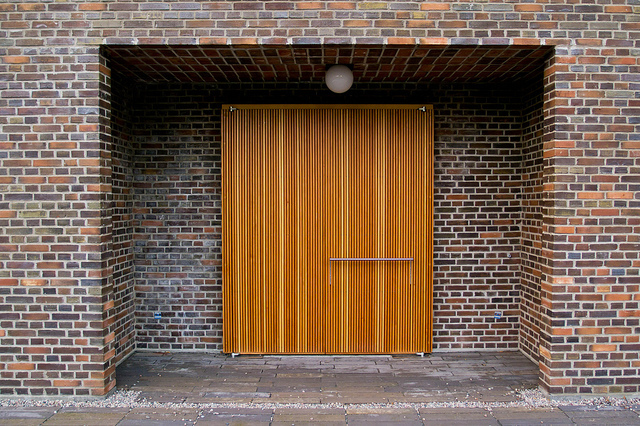 Rather than forcing strict corners with the issues which this creates for the brick-layer, glazed and unglazed bricks meet in a kind of carpenter’s joint at corners and as a sort of base-board set into the floor where the planes of wall (or bench) meets floor. I found this to be a strikingly simple and pragmatic acknowledgement of the tolerances in the material. In another instance, a room which the mason used the wrong brick for the walls was left as it was, here the rough bricks meant for an exterior wall are a distinctly untactile reminder of the natural state of brick. By incorporating mistakes into the finished architectural product (rather than pursuing a legal battle to rectify mistakes and claim one’s due), Celsing is practicing a sort of congregational agency, I would argue. One aggregating the material, the craftsman, the time element and the designer in a process underpinned by flexibility and open-endedness. Manuel DeLanda, ‘Material Complexity’ in Neil Leach, David Turnbull, Chris Williams, eds. Digital Tectonics, Wiley-Academy, 2004. Reading this cluster I am none the wiser as to what noopolitics actually means, yet these readings resonated with me. If, as Foucault claims, control societies are taking over from disciplinary societies, what is the effect of living under ”continuous assessment” where access to information is mark of one’s place in society (Deleuze)? I am especially struck by the claim that ”in control societies you never finish anything” (true!) and being the unfinished specimens we are, always becoming never being, how vulnerable we are to the onslaught of consumption society. Deleuze describes the shift toward a control society as marked by ”a capitalism no longer directed toward production but toward products, that is sales or markets” (Deleuze). This captures, I think that the relationship between supply and demand is no longer unidirectional, today supply generates demand, if the marketing is effective enough. A good example is the proliferation of corn byproducts due to industrialized farming (in North America) where corn is used to feed livestock. For a time this generated an overabundance of corn syrup for which new products were invented to capitalize on this by-product. Hence, the explosion on the world markets of soda beverages and a number of other products using corn syrup (rather than the more expensive cane sugar) as sweetener. Thus is created an entirely constructed market niche whose express purpose is to sell a product whose ”service” to share-holders is to create revenue out of a waste byproduct. (Detailed in the book Fast Food Nation: The Dark Side of the All-American Meal, by Eric Schlosser). For the consumer in a captitalist society, it becomes increasingly clear that the ”job is to discover whose ends these [service-products] serve,” to modify Deleuze’s point somewhat. In the cultural context of current global capitalism, the ”capacity to act and the capacity not to act” as outlined by Agamben (in Hauptmann) is cast as the power to purchase or to abstain from purchase of whatever product is being marketed at you. Hauptmann considers this desired quotient the result of intensely branded networks linking commodities in an ”attention economy” (Hauptmann). If effective branding can be likened to a dynamic transmission of (collective) memory serving to increase the desire quotient of a given product, then such an affective (rather than cognitive) transmission means that we are constantly barraged with persuading forces (both outright marketing as well as trends picked up in the orbits we move in). Henri Bergson’s description of the brain as not so much having thinking as its primary function, ”but that of hindering the thought from becoming lost in dream” seems an apt description of the challenge of living in today’s consumption-oriented societies (Hauptmann). How do we protect ourselves and our solitude from the onslaught? How do we defend the ’stimulus independent’ mind-wandering so important for self-reflection and to position ourselves and our values so that we are free to exercise a will independent of the control channelled to us by our gizmo-oriented lifestyles. As I sit here with an Ipad, not one but two Iphones and my MacBook in front of me, I realize how willingly and whole-heartedly I have succumbed to both a cyborg-existence and to the marketing vehicle and trendy affects aimed at me. 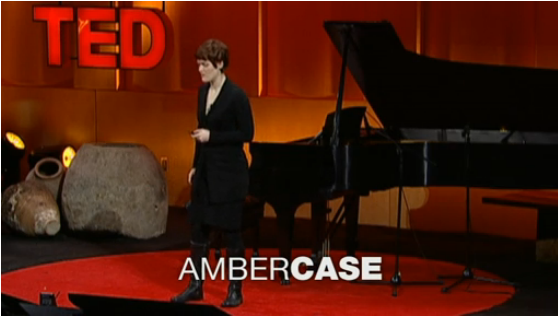 I’m reminded of a Ted Talk with so-called cyborg anthropologist Amber Case who suggests that it is when you have no external input that you form your conception of self which is neccessary in order to define a persona which can resist constant stimuli, not merely responding to this and that input, but with an awareness of one’s own agenda. This, I would argue, is at the heart of agency and of defending agency in a control society full of supposed freedom but also muddled by noise. Gilles Deleuze, ‘Societies of Control’ in Negotiations: 1972-1990, New York: Columbia University Press, 1995. Cities are complex bodies of constantly transforming affective connections shaping and reshaping the emotional calibration of places. Emotions and affects are not equal, but emotions always imply affects. The sense of a place, that is how we on the one hand experience a place an on the other hand on how we are producing that place in question. I sit down on a bench with my eyes closed – In what ways does the act of listening in public space affect me? What do I produce through the act of listening? As an artist, exploring and as well contribution to the production of public space(s), through sound and listening as my tools, affect is the very imperceptible but yet so concrete transition between virtual and actual, around which my practice revolves. If the “artwork” in itself could be regarded as a “proposal”, the affections my work give rise to is what makes the artwork alive. How the flaneurs are “touched” by my artwork. As artist, my intention is to create art that produces a difference, that is: art that changes something and someone -but without knowing what or who. Deleuze stated that if philosophy creates concepts, art creates percepts and affects. In her chaos, territory, art Elisabeth Grosz connects to Deleuze in stating that “Art, […] does not produce concepts though it does address problems and provocations. It produces sensations, affects, intensities as its mode of addressing problems” (p. 1.) The arts produce and generate intensity, “that which directly impacts the nervous system and intensifies sensation.” According to Grosz it is affects that connect the conscious “phenomenological experience” with the non-experienceable chaos – that is according to my interpretation the immanent plane. Or as Deleuze and Guattari themselves state “For the affect is not a personal feeling, nor is it a characteristic; it is the effectuation of a power […] that throws the self into upheaval and makes it reel”. (A thousand Plateaux p.240) This goes very well with Nigel Thrifts understanding of affect, heavily influenced by Deleuze and Guattari, as a form of intelligence, a form of thinking that is, a perceptual bodily conclusion about the world, “a set of embodied practises that produce visible conduct as an outer lining”,(p. 176) – which through their non-representational character cannot be reproduced. Art is not about representing what we already know – but is instead about initiating processes beyond the conscious, embodied perceptions inviting us to not only respond but also to act. If affects is the pre-condition for the production of emotions and emotions both are produced by but also producing places, affect becomes an important drive of power in that of how cities are produced. This notion of the relation between affect and emotion has been one of the counter stones within urban sensory studies. Nigel Thrift refers in his “Spaces of Feeling” to affects as a crucial force of the production of cities that shouldn’t constantly be neglected, as knowledge of how affect operates already has become systemized knowledge; that such knowledge already is being politically deployed and last but not least; that cities could be understood through the studies of how affect operates. A concrete example of how affect is politically-commercial appropriated is MUZAK according to my opinion. MUZAK, initially a brand, is today considered as a general term for a music genre based on instrumental arrangements, extensively being produced as background music in elevators, shopping malls, or offices, with the exclusive aim of increasing the production; that is – selling more and working better. Contrary to a capitalistic reception of affect as something controllable I imagine art as an always foreign force, an embodied power of difference making. What is making a difference is always depending on situation, framing and time. The act of difference making is thus always situated, referring to Donna Haraway and situated knowledges. As an artist I never try to convince people of what they should feel, my practise rather concerns the different making itself. Melissa Gregg and Gregory Seijworth ‘An Inventory of Shimmers’ in Melissa Gregg and Gregory Seijworth eds. The Affect Theory Reader, Durham and London: Duke University Press, 2010. Eric Shouse, ‘Feeling, Emotion, Affect’, in Melissa Gregg, ed. ‘Affect.’ M/C Journal 8.6 (2005). 25 Nov. 2011. In her re-thinking of Donna Haraway’s notion of the Cyborg, also in relation to Haraway’s most recent work on the companion species, N. Katherine Hayles proposes Thomas Whalen’s concept ‘cognisphere’ as a potential model that more readily relates to our lived situation today. She states “Haraway’s insistence that the world is ‘relationality all the way down’ applies as much to technology as to companion species. …As inhabitants of globally interconnected networks, we are joined in a dynamic co-evolutionary spiral with intelligent machines as well as with the other biological species with whom we share the planet.” Hayles sees the cognisphere as a way to incorporate all of the ‘interconnected cognitive systems’ we are submersed in everyday at a global scale, but rather than locating them within a single figure like the cyborg, she hints at a more disembodied set of cognitive flows that bounce between multiple figures and sources. While I can understand the cognisphere as a relevant description of the complex networks we live in, and even agree with Hayles’ important point that today our lives are equally infused with technology and biology, I think the cognisphere perhaps loses some of its political potency in what I perceive as a move toward a model that is more abstract and less specific. I would argue that the compelling strength that the cyborg possesses as a tool for provoking political change, is its ability to evoke our recognition/sympathy with the single ‘human’ figure of the cyborg, while the split subjectivity enables a necessary distance to our own human animal selves in addressing difficult areas of struggle. In other words, the melding of technology and biology are already there, and it is rather a question of the specific single figure of the cyborg, as opposed to an abstract multiple set of flows. I wonder, how do you politically organize abstract sets of cognitive flows? And is it more easily dismissed than a collective struggle of many single figure cyborgs? Likewise, I detect another (unconscious?) 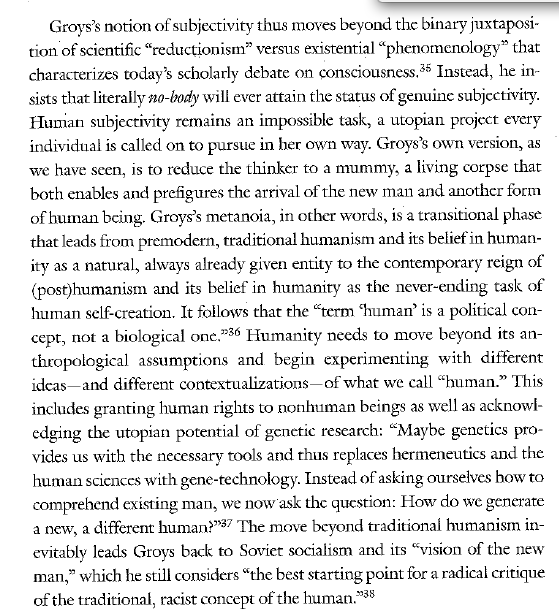 move away from the political dimension of Haraway’s cyborg in Hayles’ shift from ‘consciousness’ to ‘cognition,’ in order to make the transition from humanist to posthumanist and a clearer connection to technological environments. Although Haraway ends her text with the cyborg in a rival relation to the goddess, I suspect that it is not only a reminder of how important internal self-critique and self-reflection are, over privileges within the practices of ‘white’ feminist theory and politics, but it is also a strategic connection back to important historical feminist ties and perhaps a homage to those who came before us. In the shift to ‘cognition’, Hayles leaves behind ‘consciousness’ and its connection to the feminist tradition of ‘consciousness raising’, which was an important part of feminist history and a tool of empowerment (often for women who didn’t have an academic voice). ‘Cognition raising’ doesn’t pack the same punch I’m afraid, and it loses touch with a lineage of specific feminist tools in an attempt to become more generally inclusive… and perhaps less politically loaded? Donna Haraway, ‘A Cyborg Manifesto: Science, Technology and Socialist-Feminism in the Late Twentieth Century’ in Simians, Cyborgs and Women: The Reinvention of Nature, London: Free Associations Books, 1991. In his article “The Concepts of Life and the Living in the Societies of Control” Maurizio Lazzarato describes a chronological development from disciplinary societies to control societies – following Foucault’s acknowledgment of this difference when developing his biopower analysis of the disciplinary states of prisons, hospitals, etc., and distinguishes bio-power and bio-politics on the one hand from noo-politics on the other. 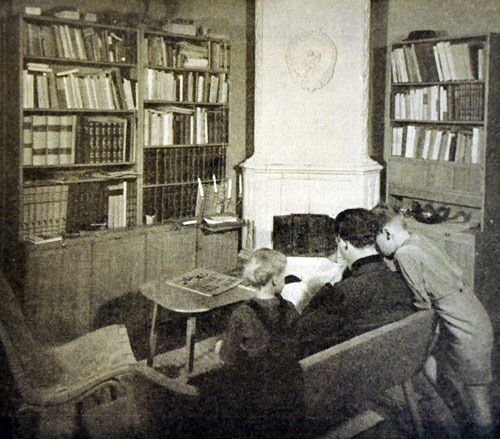 Institutional and political control are performed through various means and techniques in disciplinary societies and societies of control, from “the moulding of the body ensured by disciplines (prisons, school, factory, etc. ), the management of life organized by biopower (Welfare State, politics of health, etc. ), and the modulation of memory and its virtual powers regulated by noo-politics (Herzian, audio-visual and telematics networks, constitution of public opinion, of perception and of collective intelligence).” Connected to these makings, Lazzarato draw attention to a sociological sequence – “working class (as one of the modalities of confinement), population, publics” – in which the various stages pay attention to individuals and groups through categorizations (Lazzarato, p. 186). And indeed, also through architectural history we do recognize this sequence as particular attention paid to the working class, population and publics in the making of buildings and cities. In the text by Deborah Hauptmann (which is an introduction to an anthology titled Cognitive Architecture: From Biopolitics to Noopolitics), she emphasizes the importance of Lazzarato’s text specifically in its distinction between bio- and noo-politics and his assertion that even though societies of today are increasingly controlled (and governed) through our minds, the bodily control as described by Foucault’s disciplines are not obsolete but function in parallel with more contemporary confinements of mediation. Lazzarato condemns the labor movement and its persistence of focusing on work, which points at Marxism’s current impotence. It is true, as Lazzarato concludes his article, that the labor movement “has nothing to put in the place of praxis” and that “[i]t can’t imagine a process of constitution of world and self which is not centered around work.” Marxist ideology, as different to the current politics of the labor movement, is also centered around the concept of work, and with this, its compatibleness with disciplinary societies is obvious. Similarly, it is perhaps equally clear that it is incompatible with the current control societies? Lazzarato is, however, omitting the (primary) function Marxist ideology has (have had) as critique. Although he has written extensively on capitalism and consumerism in relation to the historical changes of work and production, Lazzarato is not in this text linking praxis and critique. Deleuze, on the other hand, tie the changes from disciplinary to control society directly to the mutations of capitalism, from production to metaproduction. In the latter, capitalism is “no longer directed toward production but toward products, that is, toward sales or markets.” Deleuze is asking (in 1990) “whether trade unions still have any role”? Similarly, we could questioned Lazzarato’s view that the labor movement should find a replacement of praxis – this is what they are all about – but instead put out a quest for something replacing labor, a perspective that is able to critique the current guises of capitalism in the same way the labor movement put forward an alternative mode of production. If production (and then employment) was key to both capitalist and Marxist organization of work, perhaps it is the mediation and subjectivation of publics that (at the moment) is the central aspects of capitalist transformation? But what kind of alternative is coming out of (architectural) mediation or subjectivation? Perhaps an effective capitalist critique? Or something that make us come to terms with the current “fluid politics” and the “modulation” of capitalism? It seems clear that such “publics” will not be compatible with the institutional organization of parliamentary politics which arguably still is too rooted in a disciplinary state of control. I look at this woman. Who is she? In last scene of Godfather trilogy, Francis Ford Coppola creates an affective scene, an unforgettable expression of loss, pain, love, violence and revenge. From the moment when Mary Corleone is shot to the end of that very scene, several delays are applied as a technique in expressing intense emotion that strongly affects spectacles. Coppola through choreographing gestures and bodily movements and voices creates two very influential moments in this scene. One is a suspension between death and life when Mary walks in shock toward her father, Michael Corleone, a suspension when the father realizes his daughter is shot and forgets his own injury; like he is not shot himself at all. The repeated shifts of camera from Michael to Marry, by focusing on their shifts of emotion are expressed in facial and body gestures. This repeated shift delays the transmission of emotions from the actors to the spectacles and this delay increase the strength of affection. But second part and even the more affective moment starts when Michael screams to the sky, and Coppola cuts the sound of the scream for some seconds. This cut of the sound together with the facial and body gestures, and the slow motion of the scene intensify the emotion that is transmitted to the spectacle, and then the moment when the sound of screams reveals and the motion returns to its normal pace, one is flown away by the exploded intensity of emotion. Here delays are the most influential technique to generate affect. This delay shows all the tiny incidents, the micro-changes and shifts that creates the whole process; a process that we usually conceive as a whole. All these tiny gestures in between or all the tiny gestures that creates this totality that we call it sorrow, cry, scream have their own importance in creating an affect. This is what Bill Viola also does in his videos. In his work “The Quintet of the Astonished”, which is a display of different emotional expression of a group of people, shown in an extraordinarily slow pace, makes the spectacle being confronted with a slow process of affect instead of arriving too fast to the result in the natural pace we are experiencing things in everyday life. As Nigel Thrift states in “Spatialities of Feeling”, Viola by ‘slowing things down, shows how each element of the body takes its part in a show of emotion, which has its own contested cultural history’. The process of affect could be understood by decomposition of emotions, to recognize all the pauses, gestures, sounds, gazes etc. that creates an intense behavior, what is not anymore controllable, what escapes from the confinement of the body, or better to say becomes extension of the body in connection to others and in encounter to the others. Affect is a process consists of all voids and plentitudes of gestures. Understanding and analyzing the mechanism of affect helps us to understand how body is dispersed over time and space through emotion; how it is related to other bodies and how emotions play an important role that is usually denied. Affect is this connection. In my post on Capsular society I argued how gaze, look and voice help to create permeability in capsules. Affect is the intense accumulation of all these plus other gestures that are not controlled, and it is what exactly makes capsules permeable. Eric Shouse in his paper “Feeling, Emotion, Affect”, defines affect as “a non-conscious experience of intensity; it is a moment of unformed and unstructured potential”. What is interesting is also to see the collective role of affects. The experience of being part of unrest, rebellion or any similar forms of spontaneous collective action, shows how affect could join people, without every individual being able to reflect or explain why-ness or how-ness of their action. The affective ties are created through thousands of encounters or in Spinoza’s description of l’affect, it goes from one experiential state of the body to another and implying an augmentation in the following body to act. I rewind the video and look again. But I can’t make out any of the faces. What it is I was looking for in this scene? I look at this woman. She puts one hand on the ground, gets up and exit from the corner of the frame. By this narration Farzad focuses on one body among hundreds in the mass. He points to the importance of one story among thousand. These micro stories are what create the bigger stories. Revolution that we perceive as a macro event and an affective mass movement consists of all these personal and micro stories. It is a sea of faces, a forest of hands, and oceans of gestures and stories. Classic is a central concept in my thesis that explores the phenomenon Modern Furniture Classic. It is a complex and problematic term. It is a travelling concept (Bal, 2002), inherited from other disciplines (Classical studies, Literature, Art and Music), that is used comprehensively today, about old and new, here, there, and everywhere. It often lacks definition or explanation. In the “world of furniture” has the concept become increasingly recognized. I believe that terms chosen to describe a phenomenon is relevant to how it is perceived, interpreted and contextualized (Robach, 2010:16). I will in the following briefly reflect upon the concept of classic in relation to affect as explored by Sara Ahmed in her article “Sociable happiness” from 2008. There is no stable definition of affect as Nigel Thrift points out but it is often associated by words like emotion and feeling, for example happiness (2008:175). Ahmed illustrates a way to use affect in a practical way. She writes; “This paper explores how happiness is directed towards objects and directs us towards objects. Reflecting on happiness as the restriction of sociability, the paper considers the family as a happy object not because it causes happiness, but because of the demand that we share an orientation toward the family as a good thing. Those who are not oriented in the right way become affect aliens and kill-joys” (2008:10). I find her text relevant to my research, in particular her survey on the happy family as it has several similarities with the classic/classical concept. The way Ahmed reasons about the family as a happy object as in our collective memory works in the similar way for a classic. We have been taught through the years that a classic is a good thing and stands for good taste. To like a classic is safe. To say that you like the mass produced, stackable white plastic garden chair is on the other hand not safe (even though more than half of the population in the world most likely has got one, or maybe because of that). I believe that the term itself affect our perception of a classic. Classic implies that we have to do with an ideal or norm, something that intends to express approval and to commend. The concept of classic is symbolically loaded with values, mostly good ones. The term has since the late 1800’s widening its boundaries and is nowadays associated with all imaginable everyday things, not just matters of (high)culture (Peters, 2004). A classic can be a traditional phenomenon, for example The Wimbledon Tournament as in a tennis classic. It can apply to major sport tournaments and competitions (spelled with a capital letter). Moreover can a classic be a film, a dish, an ice cream, a car, a watch, a haircut, a song, a piece of clothing or a TV program. I guess it is the same with the happy family. Who lives in a nuclear family any longer? Ahmed, Sara. (2008). “Sociable happiness”, Emotion, Space and Society. Vol. 1 Issue 1, p10-13. Elsevier. Bal, Mieke. (2002). Travelling concepts in the humanities: A rough guide. University of Toronto Press. Peters, Pam. (2004). The Cambridge guide to English usage. Cambridge: Cambridge University Press, reprinted 2006. Robach, Cilla. (2010). Formens frigörelse: konsthantverk och design under debatt i 1960-talets Sverige. Diss. Uppsala University. Stockholm: Arvinius Förlag. Thrift, Nigel. (2008). “Emotion, Space and society”. Non-Representational Theory: Space, politics, affect. Routledge. Notions on the concepts urban collectives and collective space (as a parallel understanding of public life and public space) in the context of an actor-network ontology. People gather in certain locations to perform activities, consciously or unconsciously producing collectives. The collective spaces are to various degrees designed, transformed and equipped to produce and maintain specific collectives and their activities. The urban collective space is thus a socio-material assemblage in an urban setting. The collectives can be weak (serial collectives) or strong (group collectives), temporal and loosely organized or more durable and perhaps thoroughly structured. The weak (serial) collectives gather for example in a designated space to wait for a bus or in a market to buy fruit while others, the strong collectives (group), assembles for example to play boule or street basket. In this blog-post I will try to illuminate some aspects on the concept urban collective space, applying notions from the cluster texts. In her book “Vibrant Matter” (2010) Jane Bennet draws on concepts produced by Spinoza (conative and affective bodies) and Deleuze/Guattari (assemblage, agency and adsorbsion) to form her primary notions on “thinking beyond the life-matter binary“. From these concepts Bennet develops her ideas on material agency. Spinoza´s conative and affective bodies are “social bodies, in the sense that each is, by its very nature as a body, continuously affecting and being affected by other bodies.” (Ibid, p.21). Spinoza argues that the affective bodies (actors) “form alliances and enter assemblages” (Ibid p.22) and that the assemblages as well as their individual bodies are both conative and affective. Deleuze reaches a similar conclusion with his concept adsorbsion, which Bennet defines as “a gathering of elements in a way that both forms a coalition and yet preserves something of the agential impetus of each element.” (Ibid, p.35) Jane Bennet rephrases it “Each member and proto-member of the assemblage has a certain vital force, but there is also an effectivity proper to the grouping as such: an agency of the assemblage. (…), an assemblage is never a stolid block but an open-ended collective” (Ibid, p.24) The collective spaces are assemblages of human and non-human actors, all with separate and multiple agencies. The collective develop agencies of it´s own, without erasing the agencies of its individual members (actors) – in an adsorbion fashion. The market place, as a collective space, has exclusive agencies. The individual market stalls, being subordinated assemblages, have their own specific agencies as well as the visiting customers (members). Spinoza advocates “that the more kinds of bodies with which a body can affiliate, the better” (Ibid, p.22). Spinozas´ words can be interpreted as the collective getting stronger the more actors entering and thus supporting the assemblage … As an example we can take a street basketball collective, gathering once a week in a parking lot. Due to the configuration of the parked cars they mount their mobile basketball system and agree about the territorial boundaries for the game. The collective is produced and maintained as a loose, temporal network of humans, a space and some specific material artefacts. In a schoolyard nearby we find a noticeably stronger collective. The schoolyard harbours a full size basketball court, with lines painted on the ground and permanent basketball boards. A group of children use the court everyday, on lunch breaks and in the afternoons. In this second example the collective is stabilised by extensive social, administrative, territorial and material supporting structures. Another interesting concept presented by Jane Bennet is the Chinese shi. Shi originates from military strategy terminology. The concept captures the complex formation of assemblage agency. It does so by maintaining that the assemblage (as the collective) “owes its agentic capacity to the vitality of the materialities that constitute it.” (Ibid, p.34). Bennet further clarifies that “the dynamic force emanating from a spatio-temporal configuration rather than from any particular element within it.”(Ibid, p.35) Consequently the key tenets of shi are: the sovereign agency of the assemblage (collective), the independent agency of matter and the importance of “the very disposition of things.” (Jullien, Francois, Propensity of Things, 1995 p.13 in Bennet 2010, p.35). Transferred to the urban space discourse the concept shi may serve as a point of reference, especially in the context of actor-network ontology. In his text “Theory of the Quasi Object” (2007) Michel Serres examines the transgression from an “I” to a “We” and from “being” to “relation” when gathering or grouping, i.e. forming collectives. “It is rigorously the transsubstantiation of being into relation. Being is abolished for the relation. Collective ecstasy is the abandon of the “I”‘s on the tissue of relations.” (Serres, p.228) Serres puts focus on the emergence of the assemblage, the transformation of individual subjects and objects into relational networks that reconstitute multiple “I”´s into a “We”. Serres perspective gives me reasons to study how the networks transform the actors and what makes them enter collectives. A human actor is driven into the collective by various reasons and forces. In the collective the actor form (and is caught by) numerous tight and vibrant relations with other actors in the collective. The context of the collective network transforms the actor and turns her/him into a we-actor (wactor?). 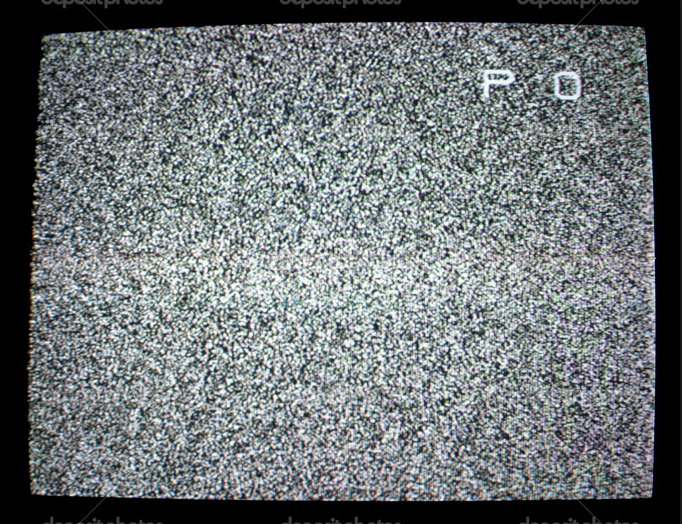 The beings are replaced with relations, the objects with the network. Michel Serres, ‘Theory of the Quasi Object’ in Parasite, Minneapolis: University of Minnesota Press, 2007. To put the cyborg concept into work in a spatial context I construct a framework where I label the cyborg objects first-hand artefacts. The first-hand artefacts are private, attached to the body and carried around. In the everyday spaces we move there are other artefacts that we interact with and through, even form assemblages with; these I label second-hand artefacts. The second-hand artefacts in this framework are detached from the body and generally belonging to a public domain, e.g. benches, bollards, lampposts, edges, canopies etc. These two categories of artefacts effect human behaviour and social interactions; they heavily influence the networks that are being produced in urban public domain. The agencies of first-hand artefacts interact with the agencies of the second-hand artefacts and of course with the agencies of human actors. For instance, the use of mobile phones can make us search for shadow to be able to see the screen properly, we try to escape disturbing urban noise to be able to hear better and we sometimes search for spots with better connection to telephone networks. Occasionally we need to put down an electronic device, a bag or a rucksack, to be able to use both our hands when handling it. Then we look for horizontal surfaces in suitable heights, as low walls, bollards, building socles, window ledges etc. Cyborgs also look for places to charge the batteries of their machines. Attractive second-hand artefacts gather cyborgs and thus become objects of appropriation and of possible social exchange, i.e. actants with obvious networking capacities. My point is that the cyborg is a prime socio-material actor with multiple and integrated agencies. The cyborg gets further complicated by the interference by a set of second-hand material agencies. This makes the analysis of socio-material agency and social exchange a complex mission. To be private means having a conceptual idea of what it is to be public. Today we are private everywhere. Owing to advanced information technology, extensive communication networks and individual, portable electric media devices we can be private everywhere. Thomas Whalen (2000) introduced the concept cognisphere to denote “the Internet but also networked and programmable systems that feed into it, (…) the globally interconnected cognitive systems in which humans are increasingly embedded.” (Hayles p.161) The cognisphere have a huge impact on our everyday lives, in private as well as in public domains. As cyborgs in cognisphere societies we can be located, contacted, talked to and heard everywhere. We are filmed, tapped, registered and even addressed by semi-intelligent machines in most public domains. As cyborgs we are constantly connected to people, information systems and spaces in spatio-temporal other-wheres. But as cyborgs, connected to the cognisphere, we can always disconnect from the immediate context and turn our focus to other places, humans or media. Our electronic devices are by all means connective but they are also disconnective. We can use them as shields against public life and protection from the mundane practises of interaction with strangers. High-tech media devices call for attention. In public domain the auditive or visual senses can simultaneously be devoted to in different realities, due to the agencies of portable media devices. Walking on a street and talking to someone in another space (and maybe in another time zone) over a mobile phone, watching a film on an IPad in a café or skyping on a train change the perception of the space we are in and the way we relate to others in that space. Strangers can easily be ignored and friends shut out. Cyborgism and the cognisphere have obvious implications on social behaviour and exchange in public space. Donna Haraway, ‘A Cyborg Manifesto: Science, Technology and Socialist-Feminism in the Late Twentieth Century’ in Simians, Cyborgs and Women: The Reinvention of Nature, New York: Routledge, 1991.